Free-floating rogue planets are intriguing objects. These planet-sized bodies adrift in interstellar space were predicted to exist in 1998, and since 2011 several orphan worlds have finally been detected. The leading theory on how these nomadic planets came to exist is that they were they ejected from their parent star system. But new research shows that there are places in interstellar space that might have the right conditions to form planets — with no parent star required. Astronomers from Sweden and Finland have found tiny, round, cold clouds in space that may allow planets to form within, all on their own. In a sense, planets could be born free. The team of astronomers studied the Rosette Nebula, a huge cloud of gas and dust 4,600 light years from Earth in the constellation Monoceros. They collected observations in radio waves with the 20-meter telescope at Onsala Space Observatory in Sweden, in submillimetre waves with APEX in Chile, and in infrared light with the New Technology Telescope (NTT) at ESO’s La Silla Observatory in Chile. In previous observations, Gahm and his team were able to estimate that most of the globulettes are of planetary mass, less than 13 times Jupiter’s mass. Now, they were able to get more reliable measures of mass and density for a large number of these objects, as well as precisely measuring how fast they are moving relative to their environment. Onsala Space Observatory, the Swedish National Facility for Radio Astronomy. Via Chalmers University of Technology. According to the team’s paper, the tiny dark clouds are being thrown out of the Rosette Nebula, moving at high speed, about 80,000 kilometers per hour. Previous research has predicted there might be 100,000 times more rogue planets in the Milky Way than stars. And Gahm and his team say that during the history of the Milky Way, countless millions of nebulae like the Rosette have bloomed and faded away. From these, many globulettes would have formed. Could there be Earth-sized free-floating planets out there? The handful of rogue planets that have been detected were mainly found with microlensing, where the planet is found when it passes in front of a background star, temporarily making it look brighter. But Gahm said they will continue to look in the radio and also the millimeter/submillimeter regime to investigate the globulettes. 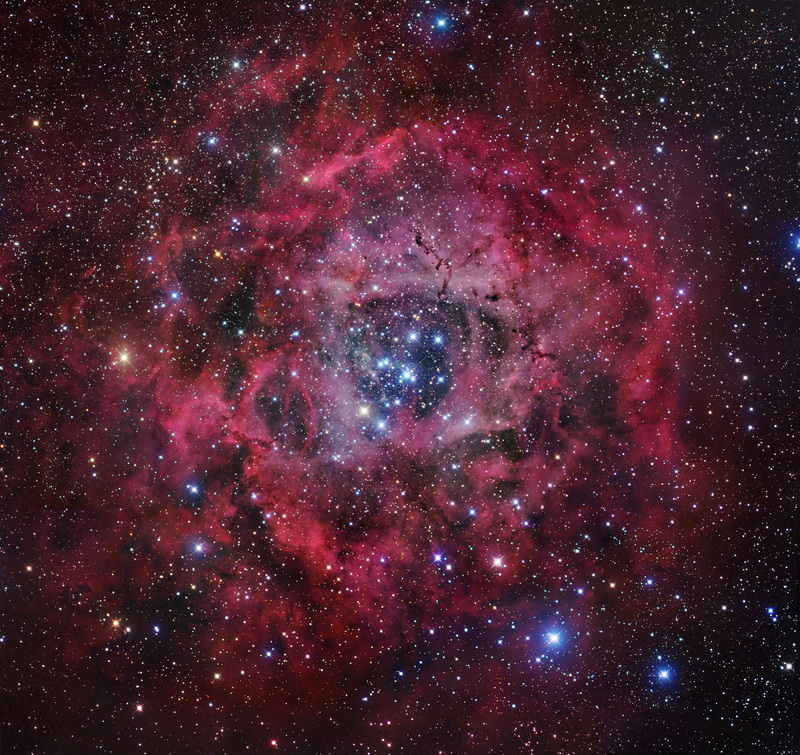 The team’s paper, “Mass and motion of globulettes in the Rosette Nebula” has been published in the article in the July issue of the journal Astronomy & Astrophysics. I’m sceptical of the claim that rogue planets are 100,000 times more common than planets. If that were so, then the nearest rogue planet to us should be 10^(5/3)=46 times closer than the nearest star, which comes out to be only about 6,000 AU. Is this likely? Wouldn’t we have detected such objects in our neighbourhood by now? At 6000 AU it would be gravitationally bound to the Solar System, wouldn’t it? Could be, but not necessarily. That’s only 0.1 light years, so it’s inside Sol’s gravitational “boundary”… if it’s moving slowly enough. That’s the key. If it’s moving fast enough it could just be whizzing on by. How would we have detected such a thing? It would likely be very dark, could be in any direction, and it would likely have high proper motion, making it hard to tell it from camera noise. Alpha Centauri moves about 3.7 arcsec per year. (Some other nearby stars are much faster; I didn’t try to find an average.) Something on a similar trajectory but 46 times closer would go 170 arcsec per year. That’s probably too fast for a stellar survey. Asteroid surveys look for fast, dim objects but they tend to be on tightly-constrained orbits. Also, the slower a rogue planet passes us, the more curved its path will be, which might also make it hard to correlate multiple observations. And then there’s Murphy’s law. Such planets could have albedo variations to confound identification. I’m not an astronomer so I can’t say for sure. The data probably exists. The computational power needed to search for the planets can probably be calculated. It may be prohibitive or doable. But it’s probably not safe to assume that thorough attempts have already tried and failed. It could be the upper limit from lensing observations. FWIW the paper refers to the common such result of ~ twice the number of stars. Well, there goes the neighborhood. Planets run away from your back yard, they set up house in popular areas (globular clusters), and now we hear they procreate among the star lanes. According to News Release from Chalmers University of Technology, through AlphaGalileo Foundation, “there may be as many as 200 billion free-floating planets in our galaxy,…” As many sunless planets as possible stars?! Skeptical of these “globulettes” forming planets, I’d be curious to know, in comparative way, the density of the “dense cores”. Truly compact enough to trigger matter build-up process (however that actually works) – as they speed away from their “nurseries”, and its “sculpting” wind-radiation environment? “Dense” like vapor clouds; volcanic plumes; ice, water; sand dunes,…???? Pfft. Any interstellar planet would not have the benefit of a star’s continual input of energy. So it woudl be cold, beyond cold, actually, near Abolute Zero (which, for you Low Information Voters) is NOT abrand of vodka. So the only response to this article, is “meh” aka so what?